Today, we're launching a new monthly feature in our Horse Care section dedicated to equine behavior and training challenges. We'll ask a panel of academic, veterinary, and training experts for their perspective and solution on common issues and present the answers for side-by-side perspective. Weaving is a term used to describe a horse who compulsively paces or sways from side to side in his stall. Weaving is widely considered a truncated version of stall walking, in which a horse may circle the perimeter of his stall repeatedly. The behavior can wear down hooves, put undue stress on legs and joints, and burns unnecessary energy, but it can also be difficult to stop. What prompts a horse to weave, and what's the best way to address the problem? Weaving is an equine compulsive disorder that may stem from genetic tendencies – perhaps those leading to a high-strung nature. It is, however, precipitated by environment stress, in particular long hours confined in a stall. All compulsive disorders are derived from naturally occurring species-typical behaviors and are performed repetitively and out of context. The natural behavior underlying weaving is locomotion (walking, ambulating). In nature horses wander around grazing for about 60 percent of the time. In captivity there is no need to graze as food is supplied in bales and buckets. Hay bales and concentrate rations are also consumed relatively quickly leaving the horse with nothing to do for the rest of the day (boredom). Walking is also seriously curtailed as stalls are physically restrictive. So, the anxious, stressed horse begins to walk to and fro in the small amount of space it has – usually right next to the door of the stall looking out. Increased turnout, feeding hay in a way it can be grazed (strewing it around the periphery of the stall so that it takes more time to consume), more companionship (with other horses preferably), stalls facing other horses and/or central working area where there are things going on), tryptophan added to diet, less grain are all ways to discourage weaving. Even with all these environmental and dietary changes, entrenched weaving may continue. Some medications may help. Possibly CBD oil (expensive) or a serotonin reuptake inhibitor like clomipramine or fluoxetine (Prozac) or dextromethorphan (glutamate blocker). I'm not sure these would be allowed in working racehorses. For a weaver, the biggest thing is to give them something to do. Usually that means keeping forage in front of them all the time and if possible, turn the horse out as much as you can. I tell people to make sure they have a hay bag in front of them and be eating. Some of them could be caused by ulcers, but for the most part I think giving them something else to do is the easiest way to go. This is a stereotypic behavior, so you have to try to break the cycle or change their environment to where they have another stimulus besides the behavior. Some people try to give them naloxone but I think the biggest thing is to try to go after the environment first. The other thing is you might have a veterinarian check them over to make sure there aren't any medical problems anywhere. Sometimes they can display pain in an odd way that may seem unrelated to the source. We used to have one horse that used to weave just after races, and we'd give her a little sedative after the race and by the time it wore off, she'd be fine. We never figured out why that filly only weaved not after work, but just after she ran. It didn't matter if she won or finished last, she'd still weave. We had the veterinarian go over her nose to tail and couldn't find anything wrong. The easiest and most inexpensive option I've seen that works is to take empty plastic gallon jugs and tie those from the ceiling of the stall if you have a ceiling. That discourages a horse from walking and weaving in the back of the stall because they don't want to bump into them and rattle them around. It doesn't work for all of them; some will weave right through it. The thing that's worked the best for us is a goat. We have an Indiana-bred that stall walks and weaves all the time but when Chivo (the goat) is with her down in New Orleans she's great. The problem with that is Chivo doesn't go to Indiana, but the guy who bred her has the goat she grew up with that he's bringing us, so she'll have her goat back when she ships back to Indiana. Goats work for most all of ours. 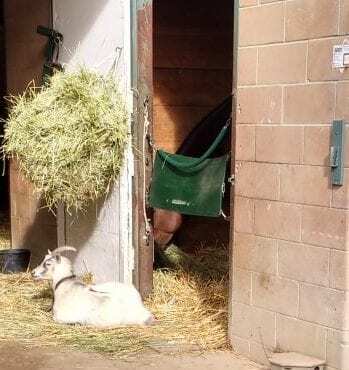 This entry was posted in Horse Care, How To Fix, NL List and tagged dr. bryan waldridge, dr. nicholas dodman, equine behavior, goats, horse care, how to fix, Tim Glyshaw by Paulick Report Staff. Bookmark the permalink.